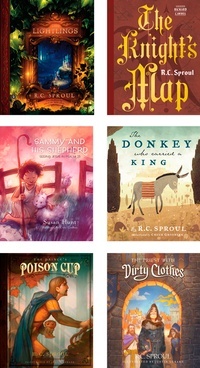 In these delightfully illustrated children’s books, Dr. R.C. Sproul continues his life’s work of making deep biblical truths clear and understandable to students of all ages. Adults and children alike have found these books helpful for understanding the fall of man, the imputation of Christ’s righteousness, the atonement, Christian humility, and many other topics. This set includes The Knight’s Map, The Donkey Who Carried a King, The Priest with Dirty Clothes, The Lightlings, Sammy and His Shepherd, and The Prince’s Poison Cup. *No substitutions or variations in book sets are allowed.